WASHINGTON -- The pomp surrounding the inauguration of the president of the United States can carry a hefty price tag, from the glitzy galas to all the inaugural balls. Think of it this way: It can cost about the same as 150 Bentley cars, several dozen yachts or some $20 million shy of the cash needed for a Boeing 737. But taxpayers aren't on the hook for the fun stuff -- the balls and other celebratory events -- and this inauguration won't be as big as the last one for President Barack Obama. A solid chunk of the tab for the 57th inauguration next month will be picked up by loyal supporters and other private donors, as it has been for years. In 2009, Obama raised $53 million in private money for his inauguration, when a record 1.8 million people braved the winter chill to see him take his place in history as America's first black president. Previous inaugural committees have raised big cash, too, though not as much as Obama. President George W. Bush had about $40 million raised for each of his inaugurals. For President Bill Clinton, it was about $30 million in 1997. But this time around, with the economy still sputtering out of the worst downturn since the Great Depression, Obama is scaling back the celebrations a bit. The official activities will span three days, starting with a National Day of Service Jan. 19 and culminating on Jan. 21 with the swearing-in, the parade and the balls. Last time, it was four days of events. As for the inaugural balls, there won't be as many. There were 10 official balls four years ago, but this time around a source close to the inaugural planning said there will be fewer balls, though no final number has been decided yet. In 2009, there also was a huge rock concert on the National Mall with U2, Bruce Springsteen, Beyoncé and many others. No repeat this time. The planning for the 2013 inaugural doesn't include a mall concert. Another big change is the way Obama will raise his inaugural funds. Unlike four years ago, he now is accepting money from corporations to help pay for the festivities, and there are no limits on those donations. In 2009, the presidential inaugural committee capped individual donations at $50,000. Lobbyists and political action committees will still be banned from making donations. Besides inauguration balls and the traditional parade, private money also would pay for items such as giant TV screens on the mall for the swearing-in and thousands of portable toilets. The other gigantic part of the tab is all the security. This cost is picked up by taxpayers, but it's harder to put a complete dollar figure on security. The Secret Service says it doesn't discuss those costs. In 2009, the federal government reimbursed the District of Columbia $44 million for the inauguration. That was just for city costs, not Secret Service or military personnel. The district's reimbursement included about $24 million paid to the Metropolitan Police Department, which hosted about 4,000 officers from surrounding jurisdictions. It also covered some $7 million for communications, call centers, fire and emergency medical services support costs. An additional $3 million was spent on repaving Pennsylvania Avenue for the parade, as well as for bus and traffic operations. For this inaugural, some public money has already been set aside. Tickets are free for the swearing-in ceremony. People interested in attending should contact their senator or congressman to request a ticket. Viewing from the National Mall does not require tickets. Not everything costs money, though. --The Architect of the Capitol has $4.2 million to spruce up the Capitol grounds for the swearing-in ceremony on the west front. 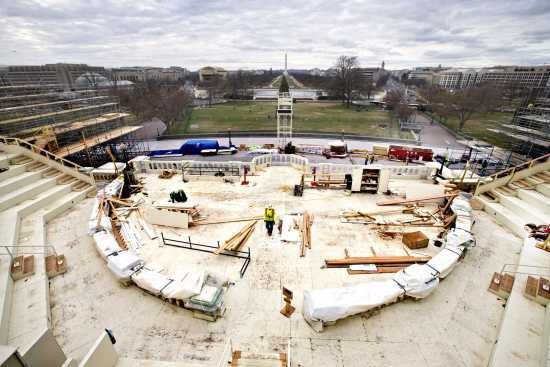 That money also pays for the inaugural platform under construction, along with bleachers, and barricades. --Nearly $2 million has been approved for U.S. Capitol Police. --$1.2 million has been budgeted for the Joint Congressional Committee on Inaugural Ceremonies, which stages the day's activities on the Capitol grounds, including the traditional inaugural luncheon for the president and vice president. The menu at the luncheon four years ago featured seafood stew, duck, sour cherry chutney and apple cinnamon spongecake. Hotel rooms, however, will cost folks, and some packages require a big fat wallet. For $100,000, the Ritz-Carlton has an "Access Washington" package that includes two first-class round trip domestic airline tickets, a four-night stay in a luxury suite, private and behind-the-scenes tours of Washington landmarks, an inaugural parade watching party at the Newseum, a designer dress and fancy tuxedo, a diamond and ruby pin and more.